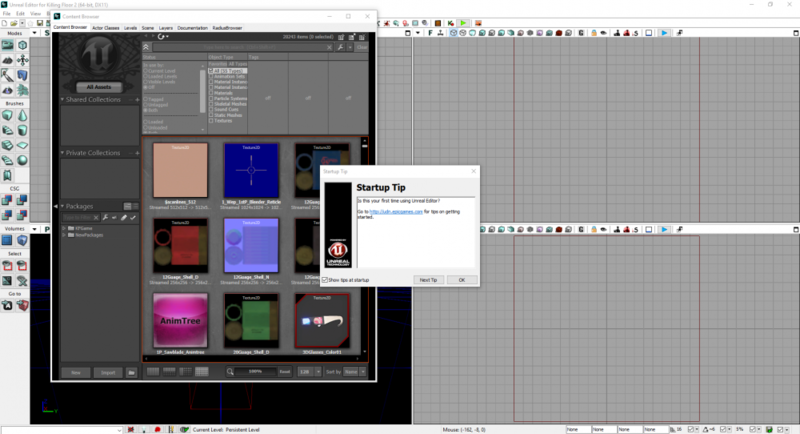 This page includes a comprehensive guide on getting started with the Killing Floor 2 SDK for creating Maps and uploading them to the Steam Workshop. This page will only cover the essentials, further elaboration will need to be done at your own discretion; it is recommended that any new Level Designer should begin by looking at Official Maps and seeing how they approach particular scenarios. Open up Steam, hover over 'Library' and select the 'Tools' option. Once the download is complete, launch it as you would any other game. Note: If an opt-in Beta/preview is happening at the time, both the game and the SDK need to be on the same branch. Otherwise the SDK will crash on launch. i.e. If you are in the opt-in Beta for an update, the SDK also needs to be on the opt-in Beta. On first launch you may be prompted with a couple of dialogs. They are things that don't affect the editor or its performance so you can ignore and click past them. See Figures 1.1. Past all the error dialogs your Editor should look something like Figure 1.2 below. Note: For new users, I highly recommend reading the Startup Tips and not disabling the prompt, they often contain useful tips on how to use different aspects of the SDK. The Terrain Tool - Obsolete, use the Landscape tool instead. Foliage Paint Tool - Not supported, will crash the Editor when you build Lighting. The Content Browser is large enough to break it down in its own image. 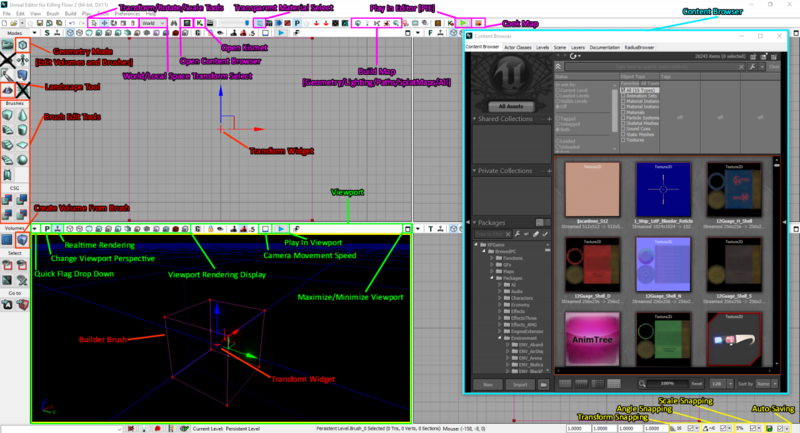 The Content Browser is where you will be grabbing all Assets (Actors, Meshes, Materials, Sounds, Decals, etc). It also serves as a tool for managing and organising your map's own individual assets, and also organising assets into Layers. Your first map can be named anything however a Killing Floor 2 map MUST be prefixed with 'KF-'. If it isn't, it cannot be played or recognized within the game. Your map file name should also match your map's name. If your map name has spaces, it is common naming convention to use UpperCamelCase. Avoid using underscores or dashes to represent spaces.You should also avoid publishing a map with numbers or 'versions' at the end, this can be a pain for server owners if they want to host your map on their server. The main reason is, when you plan to upload your map to the workshop, the Workshop Front-End will look specifically in only this location for files to upload. Additionally if you plan to cook your map, it needs to be in this location for it to successfully cook. I would avoid placing your working map file under the steam game directory as well (C:\Program Files (x86)\Steam\steamapps\common\killingfloor2\KFGame\BrewedPC\Maps). This directory may confuse your editor if you plan to import, move, rename or edit assets within your map's own directory. World Settings can set important information for your map such as: Map Name, Map Author, Spawning Modifiers, Objectives and Collectibles, What game mode is played in the Editor, what in-game music the game uses and Optimization options. To access it go to: View > World Properties. Input your map name and your user name in the appropriate areas under the 'World Info' section. Change the 'Default Game Type' and 'Game Type for PIE' to "KFGameInfo_Survival" under the 'Game Type' section. While the auto-save function is useful for beginners, most users that become familiar opt to turn it off as it can interrupt workflow, bloat your game directory and also on large maps, take a long time to save. After losing significant progress once or twice, saving frequently will become second habit. Map Optimization is the arguably one of the most important steps when completing a map. Aside from having good playable spaces, the map needs to perform well on all machines; maintaining stable Frames per Second (FPS). The following guide is a comprehensive list of areas that should be addressed before publishing a map. EVERY step should be evaluated and addressed as they will all add to performance. This page was last edited on 18 March 2019, at 02:47.